Hari ini gw bongkar-bongkar arsip lama, gara-gara Abi minta dicarikan kumpulan skrinsyot desktop, hasil ngoprek di station masing-masing sekitar 5-7 taun yang lalu. Abi dengan enlightenment-nya, sementara gw setia dengan windowmaker. Udah sampai CD ke 11, belum ketemu juga yang dicari-cari. Akhirnya malah nemu arsip salah satu proyek nusagames yang sempat terhenti, yaitu proyek fanfic (Cerita tambahan hasil karya sendiri yang disesuaikan dengan cerita aslinya) dari serial StarTrek. Jujur aja, gw sendiri lupa apa judulnya. Tapi yang jelas semuanya dikerjakan bersama-sama from scratch. Adalah Abi (Captain Elizabeth Seymour) yang dengan serius mengerjakan rancangan gambar starship-nya di Corel Draw, sebagai pesawat utama dari cerita ini, dibaptis dengan nama resmi USS Leviathan NCC-78437. Sebagai pelengkap, Jay (Admiral Henrykovich Jayanef) pun mengelola sebuah site yang berfungsi sebagai ensiklopedi, menyediakan berbagai informasi tentang segala hal yang berhubungan dengan Star Trek. Karakter yang akan berperan di cerita ini pun mulai dipersiapkan, dimulai dengan mengerjakan personal biodata serta deskripsi dari masing-masing karakter, yang nantinya akan menjadi awak USS Leviathan. Beberapa diantaranya adalah Admiral Henrikovich Jayanef, Commander Velina James, Captain Elizabeth Seymour, Lieutenant Kathy Zhang, Lieutenant Commander Annelies Mellema, Crewman Enrico Suave, Ensign Jennifer Ega dan Lieutenant Junior Grade Allaria Amarice. 2361 Enrolled in Starfleet Academy. 2362 Established Grim Reaper Squadron. 2363 Leave on absence for one year for personal affair. 2363 Saved from suspension that fell to her Grim Reaper squadron. 2364 Return to Starfleet Academy and resumed training. 2366 Graduate from Starfleet Academy. Achieved best from her class, surpassing her best childhood friend and her rival, the brilliant Ensign Velina Archer. 2366 Assigned to USS Phoenix NCC-65420 as Operation Officer. 2367 With other crew member Miles O’Brien, able convince Captain Benjamin Maxwell to call the attack on Cardassian Outpost. 2367 Promoted to Lieutenant Junior Grade. 2368 Assigned to USS Merrimac NCC-61827 as Tactical Officer. 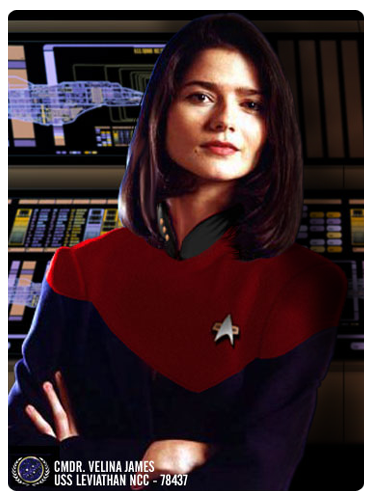 2370 Promoted to Lieutenant prior to her assignment to USS Cairo NCC-42136 as Operations Officer. 2371 Participated in Federation covert operation against the Maquis. 2376 Recalled to Starfleet and gain promotion to Lieutenant Commander. 2376 Assigned to USS Wellington NCC-28473 as Tactical Officer. 2379 Assigned as 1st Officer onboard USS Wellington NCC-28473, and promoted to Commander. 2382 Assigned to USS Leviathan NCC-78473 as Commanding Officer by Admiral Henrykovich Jayanef, gain promotion to Captain. A rather skinny female officer with 5′ 7″ tall and 108lbs. She always prefer short haircuts to ease her in any unexpected tasks that she would encounter. Her bright cool blue eyes with friendly and comforting looks makes anyone pleases to conversate with her. But on special occasion her friendly look can be perished from her face, especially on critical situations. As a Starfleet Officer, she is absolutely an intelligent officer. Often used both diplomatic and tactical to conclude delicate matters smoothly. That’s why she nicked “Silk” by her friends. She was forced to enroll to Starfleet Academy on her father will. It is not her own will to become a Starfleet Officer. But in the end, she began to enjoy the to became a Starfleet Cadet, and thanked to her father for this decision. Her hobby is drawing. She can be seen with her canvas and brushes for a whole day when her inspiration fills her. “Painting is my life!” like she always said. Another her hobby is climbing and mountaineering. She nearly killed in the year 2363, when she slipped from a cliff. Her absence of Grim Reaper Squadron that causes by her accident somewhat saved her from suspension while the other members were punished properly. In 2369, she managed to make her own Art Gallery, in London. For about 6 years (2371-2376), she was assigned to special operation to infiltrate the Maquis. Although at last she had been recalled to Starfleet, she made a great assistance for the Maquis especially when engaging Cardassian. She undertook the assignment so brilliantly, yet, she had been developing a fondness toward them. In 2381, changed her surname back to Seymour due to her divorce. The Judge decided that Daryl is to be taken under Jon custody. She established the Grim Reaper Squadron in 2362, with several other cadets back in the Academy. 2362 Enrolled in Starfleet Academy. 2363 Received a warning from Starfleet Academy for performing Kolvoord Starburst and suspended. 2366 Graduate from Starfleet Academy. Graduated as second the best after her childhood and best friend Ensign Elizabeth “Silk” Seymour. 2366 Assigned to USS Saratoga NCC-31911 as Conn Officer. 2367 Abandoning USS Saratoga with her First Officer Lieutenant Commander Benjamin Sisko at Wolf 359. 2367 Promoted 2 ranks ahead to Lieutenant. 2368 Transferred to USS Sutherland NCC-72015 as Navigational Officer. 2368 Participating during Picard armada to blockade Romulan Supply during Klingon Civil War. 2369 Transferred to USS Agamemnon NCC-11638 as Navigational Officer. 2369 Participating during Borg expected invasion under indirect command of Captain Jean Luc Picard onboard USS Agamemnon NCC-11638. 2370 Offered to Conn Officer onboard USS Voyager NCC-74656. She politely declined due her first childbirth. Later this position is the taken by Lieutenant Junior Grade Thomas Eugene Paris. 2371 Requesting to be transferred to Starfleet Academy. 2372 Assigned to Starfleet Academy, teaching navigation. 2375 Assigned to Deep Space Nine Space Station as Operations Officer. 2376 Promoted to Lieutenant Commander. 2377 Served as Conn Officer of USS Defiant NX-74205 to intercept a transwarp aperture, as an assembled force under direct command of Admiral Paris, where USS Voyager and a Borg sphere came from back from Delta Quadrant. 2378 Request a resignation as Starfleet Officer. Resignation rejected promptly by Admiral Henrikovich Jayanef. 2379 Assigned to Starfleet Headquarter, San Francisco, Earth, served under Commander Neela Darren at Stellar Cartographer. 2381 Gain promotion to Commander. 2382 Offered to take command of USS Excelsior NCC-2000. Politely declined prior to Captain Silk request. 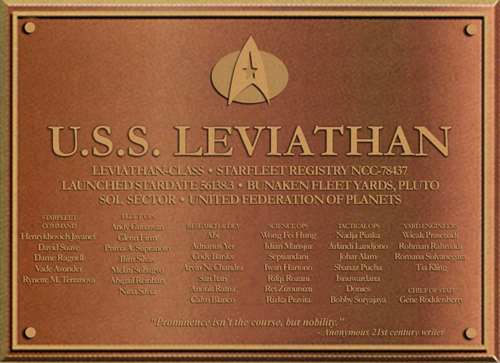 2382 Assigned to USS Leviathan NCC-78473 as First Officer by request of Captain Elizabeth Seymour. 2345 Born in Lalleham, England, on Earth. 2348 Moved to London, England, on Earth. 2349 First acquaintance with Elizabeth Seymour. 2354 Introduced to a violin by her father. 2359 Win Best Solo Performance Award on 122nd Annual Classical Chamber Orchestra Award. 2366 Graduates from Starfleet Academy. 2367 Lost all her family in battle of Wolf 359. 2370 Married to Arthur F. James. 2371 Lavaine was born, named after her father. Requested transfer to Earth. 2374 Shaana was born, named after her mother. 2375 Forced to leave her husband and her children’s because of her assignment to Deep Space Nine Station. 2378 Planning to resign because of family affairs. Resignation rejected. 2382 Reassigned by her long lost childhood friend to the same starship, and ask a personal favor to Captain to bring her family onboard. Request granted. Descendant of Captain Jonathan Archer, Commanding Officer of the historical USS Enterprise NX-01. Born in a Starfleet officer family makes her ambitions rather high. An introvert person, rarely express her feelings, except on some special occasion to her best childhood friend, Captain Elizabeth “Silk” Seymour. That’s why she nicked “Vague”. In 2363, as sophomore cadet, she received a warning due to performing the prohibited Kolvoord Starburst Maneuver, with her Grim Reaper Squadron. All the squad members have been suspended for 2 weeks. In 2367 promoted 2 ranks to Lieutenant for her bravery as she jeopardize her life to save Saratoga’s civilians, but some said that it was an honorary promotion from the Starfleet due to her grevious loss back to Battle of Wolf 359. Very talented on several musical instruments. She plays Alto Violin since 9 years old. Achieved Best Solo Performance Award on 122nd Annual Classical Chamber Orchestra Award on 2359. She also adept in Piano, Harps and Drums. 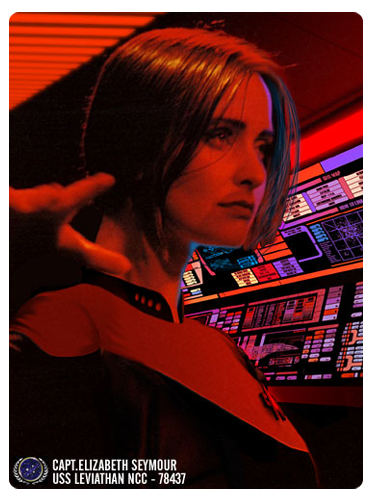 In 2378, she planned to resign from Starfleet. She wanted to be close to her child in their youth age, but rejected promptly by Admiral Jayanef. After the rejection, then she requested to transfer to anyplace on Earth. Later she assigned to Starfleet HQ. Her family was wiped out by Borg invasion led by Locutus of Borg at Wolf 359. Her father, Lieutenant Commander Lavaine Archer, was Chief Engineer of USS Melbourne NCC-62043. Her mother, Lieutenant Shaana Archer, was Medical Staff onboard the same ship with her husband. 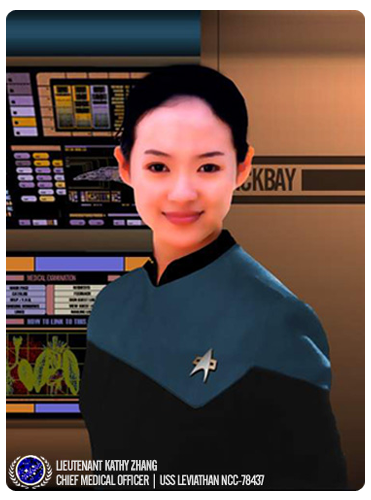 Her older Sister, Lieutenant Jessica J. Juliane was member of Security Officer onboard USS Tolstoy NCC-62095, while her other sister, Lieutenant Junior Grade Regina R. Reviane, assigned on USS Kyushu NCC-65491 as Navigational Officer. Alas, none of them was survived. Back in Starfleet Academy, she was befriended with Vice Admiral David Suave. Velina James, Elizabeth Seymour and David Suave, was on the same extra-curricular activities, chamber musical. They often have seen practicing together until late at night. 2378 Graduate from Starfleet Academy. 2381 Promoted 2 ranks to Lieutenant. 2382 Assigned to USS Leviathan NCC-78473 as Chief Medical Officer. 2356 Born in Beijing, China, on Earth. 2360 Introduced to chinese martial-arts by her father. 2366 Learn chinese traditional medicine from her uncle. 2370 Win Best Twin-Sword Performance on the 380th Annual Chinese Martial Arts Exhibition. 2371 Moved to London, England, on Earth. 2372 Assisting her uncle, maintaining her family’s medicine business branch in London. 2374 Enrolled in Starfleet Academy. 2378 Graduates from Starfleet Academy. 2381 Gain Promotion to Lieutenant. 2382 Assigned to USS Leviathan NCC-78473 as a chief medical officer, and been working there ever since. ~ by Mahén on November 4, 2007.
what the hell is this all about this is all new to me…. Wow whats its this ship ???? its beautiful but you have a technical notes ???? it is called the uss leviathan, made by a friend of mine, for our fanfic project in year 2000. glad you enjoy it. and Even if you don’t visit regularly the website, job alerts will be sent to you. On top of jobs, To assist you in your work, resources are provided not to mention resources to give a helping hand to translators in their jobs. already have an chief engineer or a chief tactical officer? semoga bisa dijadikan film/serial berdasarkan artikel ini…….